Over the past several years, this sturdy interface has become the tool of choice for systems integrators worldwide. It provides a refreshingly simple way to control DMX equipment from any system containing a serial port. Our customers have used it in systems based on AMX, Control4, Elan, iPad and many other equipment brands. 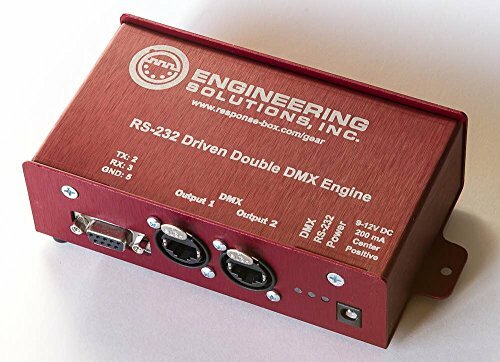 Realistically, anything gear which can speak RS-232 can drive the DMX engine. Parallel, Simultaneous, Multi-Speed Fading. Any number of scenes and /or DMX channels can be set to any number of levels, at any speed, at any time. Verbose Debugging can be toggled on and off. In basic mode, the system replies via RS-232 when commands are received and executed. In verbose mode, more detailed feedback is available. This is useful for initial programming and debugging Once a serial connection is established, most users are able to fully control their attached DMX equipment within just a few seconds. The DMX output stage is terminated with Neutrik XLR-3 and XLR-5 connectors. Each connector has its own drive stage, which means it can be used independently. Firmware can be updated in the field at any time, should future feature additions be useful in your application. The re-flash takes only a few seconds to complete. Front panel LEDs show the status of applied power, DMX output and RS-232 input. The chassis measures just 4.6″ wide x 3.2″ deep x 1.8″ tall and is fabricated from durable aluminum stock. Ships with an international power supply. Output is 9V DC, 300 mA. Find a full description of the control protocol on our company's website, which is printed on the chassis in this photo. If you have any questions about this product by Engineering Solutions Inc, contact us by completing and submitting the form below. If you are looking for a specif part number, please include it with your message.